Sad news reached us here at the LSA on January 22, 2018 with the passing of former LSA Director and LSA Life Member Raymond (Ray) M. Asprion, Jr. Ray was a long time competitor in the discipline of High Power Rifle and was responsible for bringing many new shooters into the sport. He was an enormous presence in the Louisiana shooting world and was a tireless supporter of Louisianians’ Right to Keep and Bear Arms. In addition to his work for the LSA and shooting in the state, Ray was one of the original volunteers at the WWII Museum. In particular, he was one of the boat builders instrumental in the building/restoration of the Higgins LCVP, LCP (L), and the PT-305. 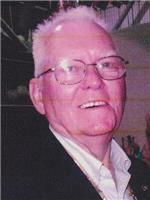 Ray’s complete obituary can be read here. Ray will be very much missed and we offer his family and friends our heartfelt condolences. 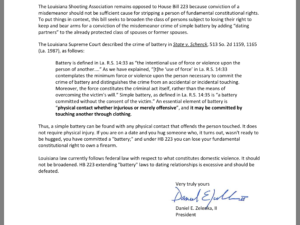 LSA President Dan Zelenka recently addressed a letter to Members of the Louisiana House of Representatives. The Annual Meeting of Members and Elections of the Louisiana Shooting Association took place on February 21, 2016. The Louisiana Shooting Association, in recognition of the state legislator who by action has demonstrated the highest commitment to the protection of Second Amendment rights, established the Louisiana Shooting Association Legislative Excellence Award in 2010. This annual award is presented to the legislator selected by unanimous vote of the LSA Board of Directors based upon that legislators actions during the most recent legislative session. The criteria used in the final selection of the award recipient includes an evaluation of the candidates continued support of responsible firearm use and ownership, their role in protecting legitimate firearm owners from ineffective and punitive legislation, and their support of appropriate law enforcement efforts relative to firearm issues. 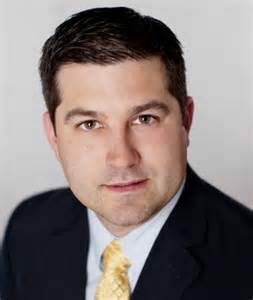 With these factors in mind, it is with great appreciation and pride that the LSA announces the 2015 recipient of the Louisiana Shooting Association Legislative Excellence Award, Senator Rick Ward, III (R, District 17). Sen. Ward serves as Chairman of the Senate Judiciary A Committee. Polo Shirts, New T-shirt Colors! The LSA is now offering polo shirts! Few can resist the delightfully soft hand and lightweight honeycomb knit texture of our 100% pima cotton polo. Crafted with 100% pima cottonone of the highest grades of cotton in the world. 6.2-ounce 100% pima cotton. The shirts have double-needle stitching throughout, flat knit collars and cuffs, locker patches, 3-button plackets, pearl buttons, side vents, and are embroidered with the LSA logo over left breast. Six polo shirt colors are available: Banana, Ivory, Light Pink, Sea Foam, Stone, and White. The embroidered logo has black lettering and black shooters over a forest green state. 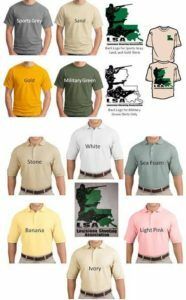 The LSA is now offering our official short sleeve T-shirt in four colors: Sports Grey, Sand, Gold (new), and Military Green (new). The shirts feature a large LSA logo on the back and a small LSA logo over the left breast. The logos on the Sports Grey, Sand, and Gold shirts will feature black lettering and black shooters over a forest green state. The logos on the Military Green shirts will feature black lettering and black shooters over a white state. Long sleeve T-shirts are still available in Sports Grey and Sand featuring the LSA logos on front and back with black lettering and black shooters over a forest green state. Larger sizes of short sleeve and long sleeve T-shirts are now back in stock! To use the form, click the download button to the right. Once you have downloaded the PDF, you may print the cards on plain paper or card stock, and trim along the lines. Alternatively, you may purchase any plain colored business card templates made by Avery (available at most office supply stores), and use the PDF template to print onto Avery business cards.